Thankfulness. Gratitude. Appreciation. Graciousness. Sounds good in an article about preschoolers, doesn’t it? But compare these attitudes to those normally seen by little ones around this time of year: envy, always wanting more, jealousy, bickering, and complaining. We desperately want to teach our preschoolers how to be thankful and not to be overcome with materialism. There is no way I can stop my two young ones from being influenced by the world of capitalism and the American love affair with stuff, but I GO DOWN TRYING! It is a matter of Christian parenting and a matter of soul care. They more they love the things of this world, the less they will love the things of God. Their little hearts are so precious at this time, so I must instill a sense that THINGS do not bring us happiness and joy. Only Jesus does that. 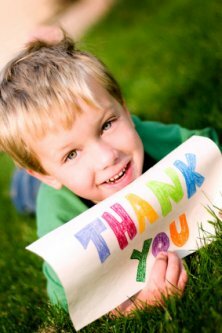 Here are some tips to teach thankfulness and gratitude to preschoolers. 1. Help them understand what they DO have. When you put them in bed at night, talk with them about how they have a bed, a warm house, covers, pillows, soft pj’s, food in their belly and a roof over their head. Share with them that there are thousands of children around the world with none of these things. 2. Instead of getting more, encourage them to give things away. The constant begging for new stuff is going to happen. If they get something new, then they should choose to give something way. Like an old school backyard trade. The hoarding of material things will produce in preschoolers a feeling that the more stuff they have, the happier they’ll be, which we all know is not true. So when they get something new, give something old away. Keep a balance between getting and giving. 3. Limit your spending on them. For Christmas or birthdays, go light. Limit the number of gifts. In our home, we have practiced limiting Christmas gift for several years and our boys haven’t noticed any different. Part of this strategy is to keep our Christmas budget in check, but it also helps teach that Jesus is the most important thing about Christmas not more stuff. 4. Show them real poverty. This might be a bit controversial but I suggest showing them pictures of children and families in developing countries or take a family drive through a rough part of town. This will show them how blessed they really are. A good friend of mine used to take his children to see the Christmas lights in the fancy part of town. He soon noticed that his 3 children felt disappointed and ashamed at how little their house looked compared to these, especially with the Christmas decorations. So the following year, he took them to the rough part of town which was much different scene. The kids never complain about their home or lights any more. Only when he show them how blessed they were did they truly become thankful. #1 is good advice. #2 is good advice. #3 is good advice. #4 is awesome advice. Wonderful article full of wisdom…well done my friend. Thanks Pastor Bob. Always appreciate a positive comment.